There is light and beauty, even in the darkest of worlds. 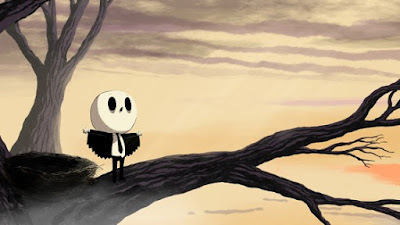 Winner of Spain's Goya Award for Best Animated Feature (where the director separately won Best Animated Short Film in the same year), Alberto Vázquez's debut feature is a darkly comic, mind-bending fantasy based on his own graphic novel and award-winning short film. Striking graphic imagery brings to life a discordant world populated by adorable (and adorably disturbed) animated critters, searching for hope and love amid the ruin. Stranded on an island in a post-apocalyptic world, teenager Dinky and her friends hatch a dangerous plan to escape in the hope of finding a better life. Meanwhile, her old friend Birdboy has shut himself off from the world, pursued by the police and haunted by demon tormentors. But unbeknownst to anyone, he contains a secret inside him that could change the world forever.